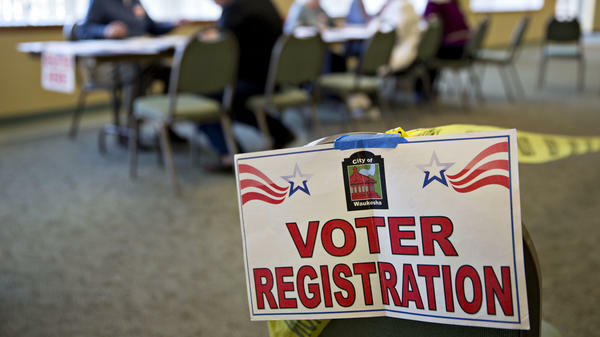 A voter registration sign hangs near a table where residents fill out paperwork at a polling location during the presidential primary vote in Waukesha, Wis., on April 5. It's no secret that voter registration lists are filled with inaccuracies. People move. Or change their names. Or die. But it can take months if not years for the rolls to get updated. Now, conservative groups are taking a number of election officials to court, saying they're not doing their jobs. Liberal groups think the real purpose is to make it more difficult for some people to vote. "This is an effort to make the voter rolls cleaner and to follow federal law before the elections in November," says J. Christian Adams, president of the Public Interest Legal Foundation. His group is behind the suits, along with the American Civil Rights Union. Adams is a former Justice Department official who has been at the forefront of efforts to restore what he calls "election integrity." Adams says they have identified over 200 counties that have more registered voters than they have residents. "We're asking states and local officials to comply with the law, to remove people who have died, to look at their citizenship lists, to find out who's on the rolls that shouldn't be on the rolls. Who could be against that?" says Adams. Stuart Naifeh, senior counsel for Demos, a public policy group fighting some of the suits, agrees that cleaning up voter rolls is important. But he worries these suits aim to go much further. He says many of the lawsuits are directed at low-income, Democratic-leaning counties. "They are targeting in many cases jurisdictions that don't have the resources to fight back," says Naifeh. "The end goal seems to be getting these kinds of settlement agreements that require the state to do aggressive voter purging." He argues that can lead to thousands of eligible voters getting tossed off the rolls, something Adams denies. The main law governing voting lists — the National Voter Registration Act — is specifically designed to prevent that from happening. Naifeh says having more names on a voter registration list than there are voters in a county doesn't necessarily mean an election office has done something wrong. "It may actually be evidence that they're complying with the law," he says. That's because the law prohibits voters' names from being removed until after they have been notified that there's a question about their registration and they fail to vote in two consecutive federal elections. Voters can be removed more quickly if there's concrete evidence they've died, moved or otherwise become ineligible. The problem is that the NVRA isn't 100 percent clear about the process. David Becker of the Center for Election Innovation and Research says local election officials have a difficult job, trying to strike the right balance. "They have to try to keep the voter lists as up to date and accurate as possible, while also ensuring that no one is accidentally removed from the list when they're still eligible to vote," says Becker. And with millions of Americans moving and dying each year, it's not easy. Adams argues that having a messy voter registration list opens the way for voter fraud, although there's little evidence of that except in a handful of individual cases. One of the counties being sued by Adams' group is Wake County, in North Carolina. Gary Sims, the director of elections there, says his state has a strict system to make sure its voting lists are clean. "We don't have the option of not maintaining our records. These are automated processes that are put in place and, like I said, very closely regulated by the state board of elections," he says. For example, if a voter in his county registers somewhere else in the state, Sims is immediately alerted. He isn't sure why his elections board is being sued. He says the problem for rapidly growing Wake County isn't that it has too many names on the registration rolls. It's that it has a lot of eligible voters who have yet to register. It's no secret that voter registration lists are filled with inaccuracies. People move. They change their names. They die. And it can take months, sometimes years for the rolls to be updated. Now conservative groups have taken a number of election officials to court, saying they're not doing their jobs. Liberal groups say the lawsuits are meant to make it harder for some people to vote. NPR's Pam Fessler reports. PAM FESSLER, BYLINE: The lawsuits have targeted about a dozen counties in Texas, Florida, North Carolina and Mississippi and even some cities such as Philadelphia and Alexandria, Va.
J CHRISTIAN ADAMS: This is an effort to make the voter rolls cleaner and to follow federal law before the elections in November. FESSLER: J. Christian Adams is president of the Public Interest Legal Foundation which is behind the suits along with a group called the American Civil Rights Union. Adams is a former Justice Department official who's been at the forefront of efforts to restore what he calls election integrity. He's found over 200 counties that have more registered voters than residents, and he sent notices asking them to comply with the law. ADAMS: To remove people who have died, to look at their citizenship lists to find out who's on the rolls that shouldn't be on the rolls. Who could be against that? STUART NAIFEH: The lawsuits border on frivolous. FESSLER: Stuart Naifeh for one. It's not that he's against cleaning up voter rolls, but he fears that these suits aim to go much further. He says many are directed at low-income, Democratic-leaning counties. NAIFEH: They are targeting in many cases jurisdictions that don't have the resources to fight back. And the end goal seems to be getting these kinds of settlement agreements that require the state to do aggressive voter purging. FESSLER: Something his group, Demos, and others have been fighting because they claim thousands of eligible voters get tossed off the rolls in the process, something Adams denies. Still, the main law governing voting lists, the National Voter Registration Act, is specifically designed to prevent such purges. Naifeh says too many names on the list doesn't necessarily mean that an election office has done something wrong. NAIFEH: They may actually be evidence that they're complying with the law. FESSLER: That's because the law prohibits a voter's name from being removed until after they've been notified that there's a question about their registration and they fail to vote in two consecutive federal elections unless of course there's concrete evidence that the voter has died, moved or otherwise become ineligible. The problem is that the law isn't a hundred percent clear how all this should be done. David Becker of the Center for Election Innovation and Research says local officials have a difficult job trying to strike the right balance. DAVID BECKER: They have to try to keep the voter lists as up-to-date and accurate as possible while also ensuring that no one is accidentally removed from the list when they're still eligible to vote. FESSLER: And with millions of Americans moving and dying each year, it's not easy. Adams of the Public Interest Legal Foundation argues that messy lists open the way for voter fraud, although there's little evidence of that except in a handful of individual cases. Gary Sims runs elections in Wake County, N.C., one of those being sued. He says his state has a lot of protections against fraud and a strict system to make sure its voting lists are clean. GARY SIMS: We don't have the option not maintaining our records. These are automated processes that are put in place and, like I said, very closely regulated by the state board of elections. FESSLER: For example, if a voter in his county registers somewhere else in the state, he's immediately alerted. Sims isn't sure why he's being sued. He says the problem for his rapidly growing county isn't too many names on the rolls. It's too many eligible voters who've yet to register. Pam Fessler, NPR News. Transcript provided by NPR, Copyright NPR.